There's a war occurring each day in our backyards - plant versus plant-eating insect versus insect-eating insect. Research by UC Irvine's Kailen Mooney suggests the outcome - of interest to farmers - is a stalemate. For a study published online Friday, March 26, in the journal Science, Mooney and colleagues studied 16 species of milkweed, a group of flowering plants found throughout the Western hemisphere. The scientists sought to determine the relationship among plant growth, how plants defend themselves against plant-eaters (with thorns and toxins, for example), and the protection plants receive from predators such as ladybugs that eat plant-hungry insects. The herbivores - in this case bright yellow aphids - damage plants; ladybugs can act as bodyguards, helping plants by eating aphids. The researchers asked: Can plants have it all? Can they grow quickly and defend themselves against herbivores while at the same time solicit protection from ladybugs and other bodyguards? Milkweed species that grow quickly (a desirable trait) are more vulnerable to insects that feed on them (an undesirable trait), making those plants more dependent upon predators for their survival. In other words, you can be either a hard-to-eat, slow growing plant that doesn't need bodyguards, or a tasty, fast-growing plant that relies on outside protection. The finding could be important to farmers trying to develop herbivore-proof, fast-growing crops, and it betters our understanding of how the natural world works. "We can breed plants to for fast growth, but if we do that, it appears we're weakening the plants' immunity against herbivores, making them more dependent upon protection from potentially unreliable predators," says Mooney, assistant professor of ecology & evolutionary biology. And there may not be much that farmers can do. "Milkweed has been evolving for as many as 20 million years. 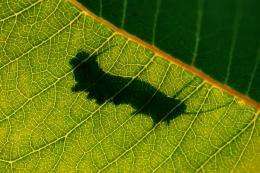 Natural selection favors faster-growing plants and those that easily fight off insects," Mooney says. "If nature hasn't found a way to combine both, perhaps it's something that cannot be done." Cornell University scientists Rayko Halitschke, Andre Kessler and Anurag Agrawal also worked on this study, funded in part by the National Science Foundation.